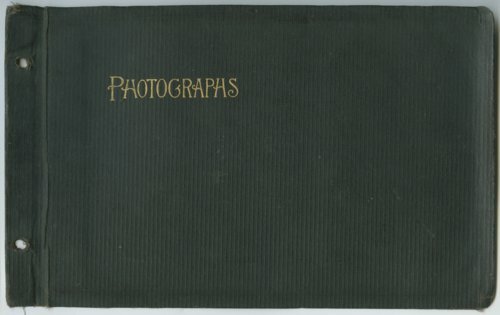 This scrapbook was created by Lester Ira Arnold and contains photographs and documents of his training and service in World War I (1917-1919). The album shows views of barrack life at Camp Pike in Little Rock, Arkansas, American soldiers in France and Germany, and also battlefield scenes and postcards scenes in Europe. Lester Arnold was born on October 9, 1890 in Piedmont, Kansas, to Moses Tandy Arnold and Margaret Herald Arnold. He attended school at Southern Kansas Academy in Eureka, Kansas, and graduated in 1915 from Washburn College in Topeka, Kansas. In the fall of 1917, he enlisted in the United States Army and received basic training at Camp Pike near Little Rock, Arkansas. On September 14, 1917, Lester was shipped to France where he served with the 312th Sanitary Train, 87th Division. He also served nine months in the Army of Occupation in Germany. Lester was discharged from the Army on August 12, 1919 and returned to Kansas. After the war, he became the principal at Piedmont High School in Piedmont, Kansas. He later taught school in the Philippines, Puerto Rico, and New York. For seventeen years, Lester taught at the minimum security prison in Wallkill, New York, before retiring on October 25, 1955. On October 25, 1981, Lester passed away at the age of ninety-one in Kingston, New Jersey.